Coconut water has become the go-to health drink that delivers energy-boosting effects without the extra calories or sugar. But the days of the coconut water craze may be limited by a nature-given energy drink: birch tree sap. The slightly sweet, thin syrup-like liquid contains xylitol, proteins, amino acids, vitamins, and minerals, which makes it an ideal drink to cleanse the body and boost your health. Birch sap is a refreshing drink that has a hint of sweetness that tastes similar to maple syrup but is much more complex. It’s extracted from birch trees mainly found throughout North America, specifically parts of Canada and New England in the U.S. It has been marketed as a unique Alaskan delicacy with between a 1,000 and 1,500 gallons of birch syrup produced annually, says the University of New Hampshire. The health elixir is touted as one of the best juices you can drink compared to coconut water because it has restorative and detoxifying properties. Its naturally healthy, sweet, and positive nutritional profile appeals to health-conscious consumers interested in traditional and folk medicine. Birch sap can help boost immunity, fight fatigue, treat arthritis and joint pain. It also acts as an energy or sports boost to prevent migraines. The consumption of birch water can help you maintain good oral health due to xylitol. The natural sugar can prevent cavities, since some types of decay-causing bacteria cannot use xylitol as a food source. “Xylitol is a naturally occurring sugar alcohol that is harvested from birch trees and their sap. Xylitol has been proven to decrease risk of cavities and is a widely-used sugar substitute,” Doctors Matthew Nejad & Kyle Stanley, dentists at Helm | Nejad | Stanley Dentistry in Beverly Hills, Calif., told Medical Daily in an email. Birch tree sap contains diuretic properties that help to flush out harmful toxins, uric acid, and excess water from the body. Therefore, it’s also thought to help eliminate cellulite from the body. According to Weleda’s “Birch Cellulite Oil,” a dermatologically proven treatment, it aids in getting cellulite “visibly toned down after just one month.” Dermatological tests have found there is a 21 percent increase in smoothness and a 22 percent increase in tightness after just one month of twice a day regular use. Saponin, a compound in birch sap, has been shown to have blood cholesterol-lowering properties. A 1997 study published in the American Journal of Clinical Nutrition found saponins can lower cholesterol by binding to bile acids and cholesterol. The bile acids form mixed micelles with cholesterol, which facilitates its absorption. Saponins lead to the depletion of body cholesterol by preventing its reabsorption and increasing its excretion. The sap can also act as a highly-effective detoxifying agent for the liver. It captures and is able to neutralize toxic waste products. It eliminates toxins that only the liver can process such as alcohol, saturated fat, and pesticides, among many others. A 2012 study published in thePolish Botanical Society reviewed the use of tree saps in northern and eastern Europe and found birch tree sap is used as supplementary nutrition in the form of sugar, minerals, and vitamins to help the liver. 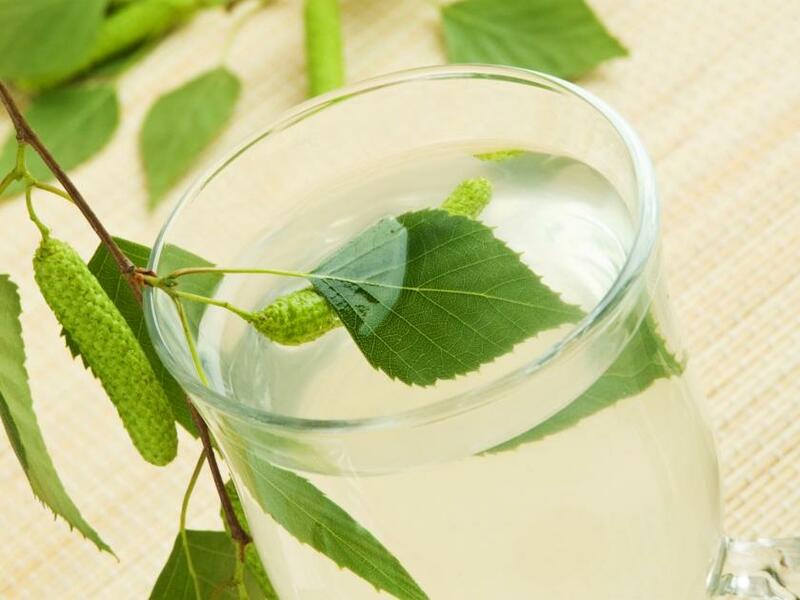 Drinking birch water can benefit the kidneys by eliminating and filtering waste through the urinary tract. It eliminates waste that only the liver can process, such as excess salt, uric acid, phosphates, certain medicines, urea, and ammonia. This helps deeply detoxify the body and can even lead to weight loss. “Extracts from the leaves have been used in herbal supplement combinations to aid detox, kidney function and bladder health by supporting the body’s natural elimination of toxins and impurities — it partly does this by acting as a diuretic,” Alice Mackintosh, a nutritionist at The Food Doctor, told The Huffington Post UK Lifestyle. Birch water is touted for replenishing the skin and protecting the skin cells. The sap can be used as a wash to improve skin texture and relieve skin problems such as eczema and acne, according to NYR Natural News. “Birch juice not only rejuvenates but also protects skin cells from oxidative stress, including Ultra Violet rays, environmental pollution, and consequences caused by inflammation,” read researcher Dr. Janis Ancans’ recent study, Yahoo Newsreported. It’s important to remember the potential benefits of birch tree sap have not all been scientifically proven, just like the claims surrounding coconut water. It’s worth giving the sap a taste for the sake of your health. Get an email of every news! We’ll never share your address.